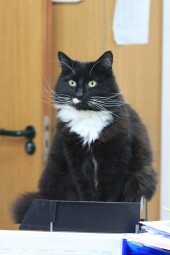 Basil joined the staff in December 2010 after being brought in in a distressed state by a caring member of the public. Once put to rights he soon demonstrated an extraordinary knack for bending the staff around his 'little' fluffy paws and has the proud honour of becoming Maes Glas Vet's first practice cat. He spends his days chatting to clients (when he can be bothered), sleeping, eating, looking after the staff in the evenings and waiting for someone to open a door for him. Any door.